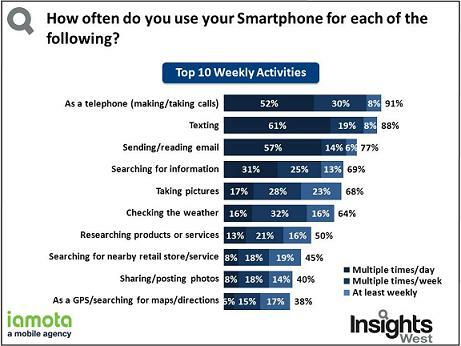 According to the latest Smartphone Insights Report by Insights West and iamota (a mobile agency), British Columbians are addicted to their smartphones. It comes as no surprise since ‘disconnect anxiety’ is seen to be widespread and many feel the phantom ‘buzz’ at times. I would say in my case, texting and email would be the most used activities on my iPhone at this point in time, easily surpassing phone calls. Only call me if you’re on fire, otherwise a text will do just fine. Are you ‘addicted’ to your iPhone? What’s your most frequently used activity during the week?